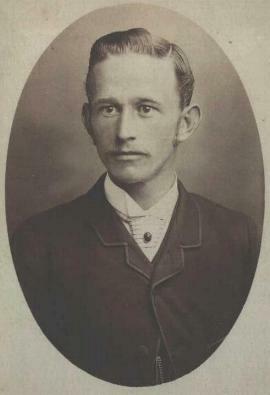 James Campbell won the Scottish Cross-Country Championship in 1887 – the second man to do so. The race for the second National Championships was held on 19th March 1887 and was held over 12 miles. A grand football match between East and West was held during the race and the announcement that the half time and full time results of the international between England and Scotland would be announced helped to attract 600 paying spectators. The race started in Hampden Park, which at that time was in the middle of the country, and went four times round the track, out of the stadium to the country over Mount Florida, past Hundred Acre Park into Castlemilk Estate, back through Rutherglen to the stadium, then one lap of the stadium completed the first of four laps. The race was won by James Campbell in 1 hour 14 minutes 24 seconds from his club mate W Henderson. James was a good club man too and worked on the Dunbartonshire Section Committee. He lived at this time in Sinclair Street in Helensburgh which had almost all of the club’s members – 16 of the 20 in the Dunbartonshire Local Section lived there, the other four being from Dumbarton. The speed with which the sport was spreading in all parts of the country was partly evidenced by the fact that in two years the section had grown to 62 members from the whole of the county. By 1889/90 he was section captain. His competitive record over the next few years was good. In season 1887/88 his track record included 2 firsts and 2 thirds in a scanty programme. In 1889/90, there were three first places and three seconds. By 1890/91, having been local captain for three years, he was the Dunbartonshire local vice president. He had one first, two seconds and a third to his name in summer 1891. Came the cross country season he was first in the Dunbartonshire section cross country championship and third in the National Cross Country Championship won by team mate Andrew Hannah. By 1891/92 he held no office on the Committee and his racing record was one first and four thirds. He did not return to the committee but his summer racing was as good as ever. In 1892/93 he had three firsts, seven seconds and a third. The club stopped printing the athletes’ racing successes that year in an effort to save printing costs but he appears in the club handbook as a club member until 1900 when the handbook ceased to print names and addresses of members. James Campbell was a doctor by profession – a fairly stark contrast to his predecessor as national cross country champion AP Findlay who was a stone-mason to trade. You can see from the portrait photographs that he was a professional man. Nevertheless he was a hard, hard racer who lived up to his nickname, never being afraid to go with or even set the pace against opponents of all standards.